DIXON… State Representative Tom Demmer (R-Dixon) was presented with the Illinois Association of Park Districts’ (IAPD) Outstanding Legislator of the Year Award at its annual conference held last weekend. “We are very pleased to recognize Representative Demmer as one of the Illinois Association of Park Districts’ Outstanding Legislators of the Year. During his time in the General Assembly, he has demonstrated a keen understanding of the vital role that park districts play in improving the quality of life in communities throughout Illinois. We are extremely grateful for his tremendous support of our efforts to ensure that park districts continue to provide local citizens with the highest quality parks, recreational programming and other valuable services in the most efficient manner possible,” said Peter Murphy, IAPD’s President and Chief Executive Officer. 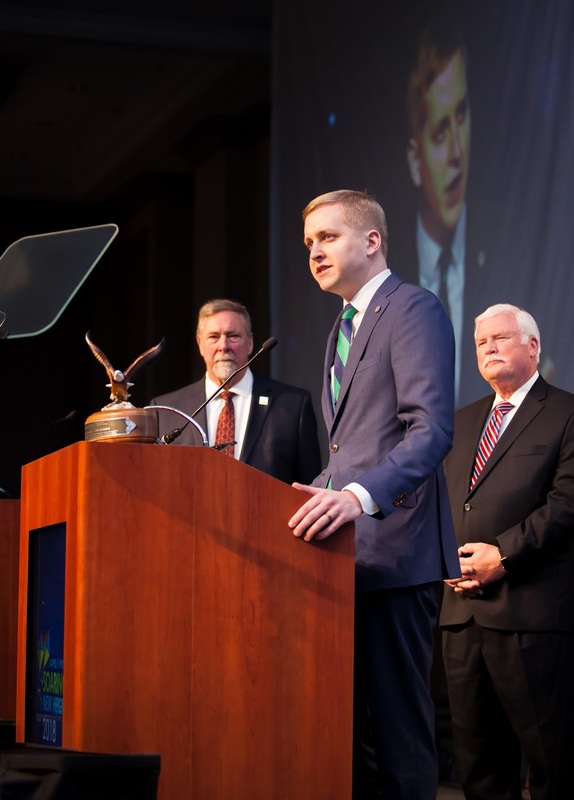 The Outstanding Legislator of the Year Award was presented at the IAPD/ Illinois Parks and Recreation Association’s annual conference, attended by over 4,000 park and recreation elected officials and professionals. “I am honored to receive this award from IAPD and look forward to continue working on ways to maximize park district use to add to the quality of life of all Illinois residents,” said Rep. Demmer. IAPD was established in 1928 and is the oldest state association for parks, recreation, and conservation in America. The association serves more than 2,100 elected park, recreation, and forest preserve district members who govern more than 355 agencies employing 67,000 individuals. IAPD strives to improve Illinois’ quality of life through park districts, forest preserves, conservation and recreation agencies by establishing grants and other new revenue streams for park land, facilities and services; educating the public about the positive effects parks and recreation have on communities; and meeting the problem of decreasing open space in Illinois.